Michael Dunlop is aiming to add another record to his impressive list of achievements in 2016 as practice gets under way at the MCE Insurance Ulster Grand Prix. The Ballymoney ace arrives at Dundrod in fine form, having dominated the Superbike class this year with wins at the Isle of Man TT, alongside victories at the North West 200, Southern 100 and Armoy. He also took his Hawk Racing BMW to a blistering new lap record on the island and as the first bikes take to the track at Dundrod, Dunlop is quietly confident that he can bring that pace to the MCE Ulster Grand Prix and add to his tally of wins. 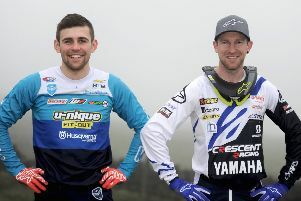 “I’ve had a good year already with wins in the big bike races at the internationals so I’m happy enough,” said Dunlop. “If you look at my times at the TT I could have done a 134mph, but Dundrod is the place where we really need to step it up now. The 27-year-old already has seven wins to his name at the MCE Ulster Grand Prix but the one accolade that eludes him is the lap record. Close rival Bruce Anstey remains the world’s fastest road racer with his 133.977mph lap at Dundrod in 2010, but Dunlop insists his primary focus will be on finding a strong set-up for the race. “The big bike is good. We’ve had a couple of problems with the other two but we should have them sorted easily enough,” he added. “We just need to work with what we’ve got here and try to make a good package for Saturday. When asked about his hopes for the new Superpole session, however, which takes place on Thursday ahead of the Plant Lubrication NI Dundrod 150 with the top 10 riders from Superbike practice battling it out with individual flying laps, Dunlop remained coy. “We’re not worrying about Superpole just yet, we need to make the top 10 first and then we’ll take it from there,” he said. Noel Johnston, Clerk of the Course at the MCE Ulster Grand Prix said: “Michael’s form this year has been nothing short of sensational and I think a lot of people are really looking forward to seeing what brings to Dundrod. “He’s been the man to beat all season on the superbike and I’d be really surprised if he’s not in contention for a win on the big bike,” he said. The MCE Insurance Ulster Grand Prix and Plant Lubrication (NI) Dundrod 150 road races run between August 8-13. Tickets can be purchased during Bike Week at Topaz Airport Road Service Station and Whitemountain Centra Service Station or on the approach roads to the circuit on practice and race days. For full details visit ulstergrandprix.net.